Happy shopping, everyone! 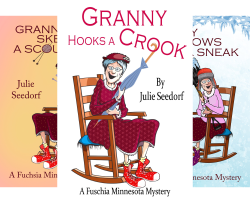 This is Anne Hillstrom, antique enthusiast, and star of the Antique Hunter Mystery Series. I haven’t been on social media recently because I’ve been busy hitting several local resale stores, estate sales and flea markets. Of course, I’ve been mainly looking for items to resell in our antique store, Great Aunt Sybil’s Attic, but would I be remiss in adding a couple pieces to my own collection? as well as this gold and pink sapphire Victorian necklace. There’s always room for jewelry even in my small apartment above the antique store. I had to purchase a small jewelry cabinet to hold some of my recent finds. While I’ve been busy finding “finds” for our store, CC has been equally busy, planting her spring garden, learning about herbs and their medicinal uses. We took a trip to Asheville, North Carolina, where she was fascinated by Appalachian herbal remedies and now she has become quite the expert. I personally am not a fan of the nettle leaf tea or some of her other concoctions but I’ve learned it’s best to humor her. She is willing to share many of the tips she is learning so I’m sure you will learn more. While we were in Asheville, we spent a day at the marvelous Biltmore Estate. Not only is the estate fabulous but they had a display of costumes from Jane Austen movies. The detail on many of the dresses is simply stunning, and the backdrop of this Gilded Age mansion made it a spectacular exhibit. I could simply live on the back porch of the estate with its view of the inside of the house. I pictured myself touring the house with my washed apple green silk gown swirling around my ankles, enjoying high tea in the morning room or a five-course dinner in the grand dining room. After our stop at the Biltmore, we visited several area antique stores including our favorite, the Tobacco Barn, a mega warehouse with stained glass galore, reclaimed wood and furniture. I did not buy anything this trip but plan to return when I renew construction on my house. We also stopped at many of the local breweries. Asheville is known as microbrewery capital of the United States. I strolled the downtown art galleries while CC spent an afternoon with a brewmaster, and now she has set up a brewery at the farm where we have our restaurant. Of course, what would a Spoon Sisters road trip be without a little adventure? I don’t want to share all the details here but you can find out more about our Asheville trip in Murder for Sale, due out by late summer. In the meantime, you can spend some time with CC and myself by reading the first four books in the Antique Hunters Mystery Series. Thank you to Julie for letting me put a guest appearance on her blog today! I have to run, shopping awaits.